The word cavitation we heard several times in the application of fluid. It has many dis-advantages in the fluid flow and it should be avoided. To neglect the effect of cavitation, firstly we have to understand the basic concepts about it like, what is cavitation and How it is formed in fluid flow like in pumps and turbines etc. Before discuss about cavitation, we should learn about vapour formation phenomenon or how a liquid convert into vapour. Let’s takes an example, if we take water into a container and heat it. It will vaporize at 100 degree centigrade. Now ask some questions yourself. Why water boils or start vaporize at 100 degree centigrade? What if we heat water in a closed container like pressure cooker? If we talk about molecular level, molecule which try to escape the boundary or vaporize but there is also a resisting pressure (in atmospheric condition 1 bar) which does not allow these molecule to escape the boundary. This pressure is known as vapour pressure. When we heat any liquid its molecular pressure increases and at some extent it will reaches the surrounding pressure. At this point if we heat that liquid little more, its pressure become more than vapour pressure and its molecule start vaporize. This is how a liquid vaporize. When we increase or decrease surrounding pressure the temperature at which liquid vaporize is also increases or decreases. This is fundamental to understand vaporization. Now let’s talk about cavitation. Cavitation is also phenomena of formatting vapour bubbles in flowing fluid due to local vaporization. It is a low-pressure phenomenon. If the pressure of the flowing fluid at any point in the fluid flow becomes less than the saturated vapour pressure at constant temperature then the cavitation occurs. 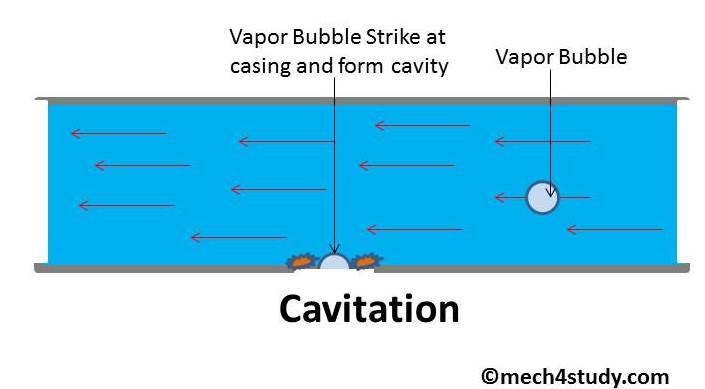 In cavitation, cavities of vapours in liquid or bubbles are formed. At low pressure the boiling temperature of the water decreases for example the boiling temperature of water at 1.23kPa is 100c which shows that as the pressure of flowing fluid goes below the vapour pressure, a kind of boiling will start and bubbles are formed. 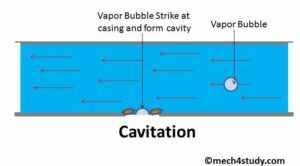 When these bubbles or vapour cavities start moving to the high-pressure region then the high-pressure fluid collapse with these bubbles and strike to the wall which leads to high wear and tear of casing, this whole phenomenon is known as cavitation. Cavitation generates high impact forces which affect the working part badly. It reduces the life of the components. It generates several noises and vibrations which causes extra damage of mechanical components. Fatigue failure in the hydraulic components is seen because of the cavitation. When the large number of bubbles with high pressure strikes to the surface of running part then erosion and surface pitting occurs which leads to damage the running components. Always maintain the proper pressure of fluid flow by controlling its velocity and flowing area, flowing liquid pressure should not be gone below vapour pressure. In fluid flow as the temperature increases the vapour pressure also increases which leads to the occurrence of cavitation or we can say that at high temperature chances of cavitation is much higher, so temperature should be controlled at a particular range. In case of pump cavitation is avoided by keeping the suction pressure above the saturation pressure of the liquid. Try to keep the suction head small or mount the pump near to the reservoir. This is basic idea about cavitation. If you have any query regarding this article, ask by commenting. If you like this article, don’t forget to share it on social networks. Subscribe our website for more informative articles. Thanks for reading it. ← How a Solar Power Plant Works and What are main Types of it?